Pancakes for breakfast on this sunny Sunday! I made these with ground almond, egg, and cream. I also added some psyllium seeds to make the dough thicker. The result was ok. 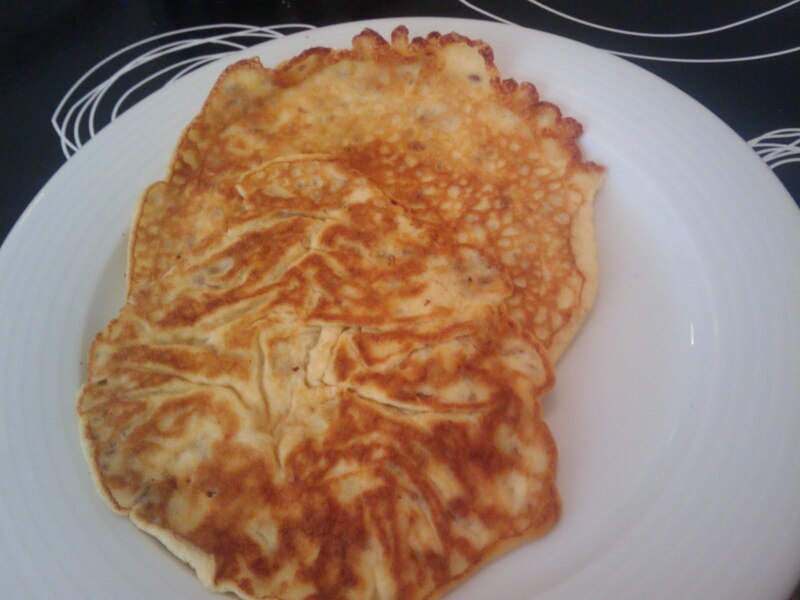 They looked like real pancakes, but the taste can still be improved. Next time I'll skip the psyllium seeds and add some dessicated coconut instead. Don't expect a non-low carber to give up his or her regular flour pancakes for these ones but it's definitely a good low carb alternative if you want to eat the same food as your company. I haven't counted the psyllium as the body cannot extract any energy from the whole seeds (or something like that). Just to warn that this will most likely turn into a LCHF / running blog. I just (pre-)registered for Edinburgh marathon. Almost exactly a year from now, I will be running 42.195 km. This has been a goal ever since I started running (jogging) but I never had the courage to sign up for a race. Now I am close to my worst running shape ever and to be honest I am not sure I can do this. Edinburgh is a fast race so I hope that means it is easy as well. But still. 42 km - there is no way I can get around without lots of exercise this year. I have some stressful work months ahead and will have little time for exercising but I am hoping this will keep me on track. I mean, it has to! Have to start look for training plans. I am scared. I didn't know Zuckerberg was interested in sustainable farming. Interesting initiative! Chicken I like a lot - and it is good low carb food, too. I eat mine with beans and dijon mustard sauce. Ttotally obsessed about dijon these days. A salad with asparagus, sunflower seeds and duck topped with a mustard sauce - mm, how delicious is that? Very! I wish I had a camera but you just have to imagine how it looked like. Think green and mustard. Now I am enjoying my first cup of coffee today. Very late for me but nice! The only things I have in the fridge are eggs, butter and mushrooms. The freezer is almost as empty - only some vegetables and fish. That's perfect for a low carb day! Lunch - Don't know yet. Lunch time is approaching but I'm not very hungry. Maybe I'll try a low carb latte made with "eggmilk" later in the afternoon...? LCHF has been around for a while in Sweden. I mean, Atkins is the father of low-carbing diets (right?) but since the Swedish doctor Annika Dahlquist started promoting LCHF in Sweden in 2005, the "movement" has become very popular in viking-land. Although Dahlquist was criticized at first (and she probably still is), she has continued to promote the diet and now LCHF is spreading around the world. Most of my readers are from America, the UK and Australia but I thought most are expats like me who heard about the news from home. Now that super-blogger Jimmy Moore has started a new blog, I am not so sure it's all Swedes anymore. I think this is really good news! It's not that I want to convert people to low-carbing, people can eat whatever they want, but I think it's great for people to know there might be an alternative way of eating out there that would suit them much better than the current fat-phobia. My LCHF is about my choice of eating LCHF and how it works in practice. It's not always easy, sometimes I fall for cravings but this blog helps me to find the way back to a healthy life style and I hope it will help you, too! Bodyrock.tv is a great resource for inspiration to work out at home. One of the things that can be used to work out at home is the Ultimate Body Press. The Ultimate Body Press is a dip bar. It allows for a few variations but is really efficient. When it first arrived I wasn't able to do one single dip. One week later I can do three (poorly performed ;)) and I'm getting stronger and stronger. I can definitely recommend this one for someone who wants to increase strength but don't have access to a fitness studio. As I mentioned yesterday, I am barely hungry anymore. The weird thing is that the only time I am really hungry is before dinner. I guess that's why I need lots of vegetables to fill the stomach without adding too many calories. Should I get worried I don't eat enough? I don't want to eat just for the sake of eating and it's a nice feeling not having to go around hungry just because I want to lose weight. I think I'll keep listening to my body for some time but probably add some breakfast. The doctors performing this are the biggest scam. Talk about taking advantage of people's weight issues. Short-term fix for loads of money - the doctors are getting rich while their patients will go back to gaining weight as soon as the patch is off. No thanks. I've been eating a lot of spinach lately. I think it tastes good, easy to prepare and it goes with most meat. It also hardly contain any calories or carbs so I thought it was healthy. But now I started using another diet planner tool called www.cronometer.com. 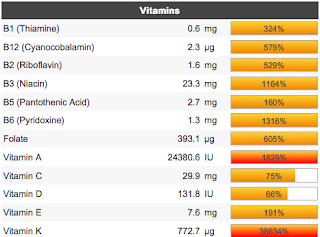 I like it because you get a detailed overview of all vitamins, lipids, amino acids and minerals measured against RDA. 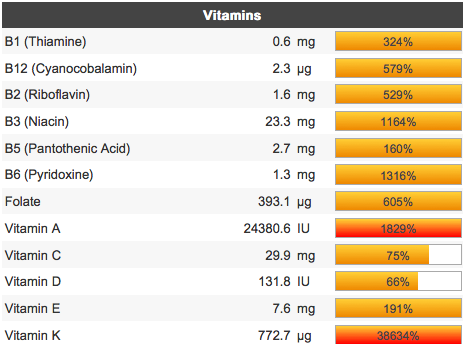 But look at this - yesterday my Vitamin A intake was 1,829% of RDA. And Vitamin K was 38,634%! Eating too much Vitamin K is not critical unless you are on some kind of blood thinning medicine. Vitamin A, on the other hand, could be toxic if intake is excessive over a longer period of time. Something that hasn't been highlighted on this blog yet is the importance of eating natural. To me this isn't specific to LCHF. You should always avoid additives and other chemicals, no matter how you eat. I really don't see the point of paying for chemicals and additives. Imagine there would be a jar of additives in the supermarket for you to buy and put on your chicken breast steak. Would you buy it? Maybe if you get a discount on the chicken? If so, how much discount do you need to get the additives? I would not want to destroy perfectly fine chicken by putting additives on it so why should I buy any additives that's already been injected into the meat? It is so sad to hear people complain that natural, organic food is too expensive while spending loads on junk food, sweets, and soft drinks. Not to mention alcohol or tobacco. (I understand some people don't have a choice because of lack of money or sometimes addictions.) What's even worse are people complaining about how expensive food is, yet, they always have the newest high-tech garment there is on the market. It is a true mystery to me how some people can prioritize material things like that over good, quality food, not only for them selves but also for their children. Maybe it's me being fooled and one day additives prove to be the best thing that's ever happened to mankind. Until then I think I'm gonna stick to natural food. I love soups! Soups must be the most underestimated type of dish. So easy to make and really quick too. You can just use whatever ingredients you have at home and it will taste delicious every time. Today I am having lentils (!) soup. Lentils are not very low in carbohydrates, but I mix them with canned tomatoes, spinach, cream and water so one portion only contains about 20 g of lentils. Add to that garlic, curry, chili or whatever spices you prefer. So good! - keep a detailed food journal - everything will be noted and published by the end of the week. Don't want to bore you with daily food journal posts. LCHF - low carb high fat. But what is high fat? Does it mean you can eat unlimited amounts of fat? Off course not. Quite frankly, I don't know what it means, just that it's more than low fat. I've thought quite a lot about the best way to eat lately. I really do like LCHF because I feel so much better not eating bread, pasta, rice or other types of starchy food but the HF - high fat - is concerning me. People say you need the fat to stay full, which I guess makes sense if carbohydrates are almost entirely excluded from the diet. The energy has to come from somewhere and if it's not from carbs or protein, it has to be fat. But I haven't felt full at all. I'm probably still fat-scared. After 2 months of low carbing, it's still weird eating excessive amounts of fat while carrots, tomatoes and mushrooms have to be weighed and tracked. I am really struggling eating 75E% fat because I feel so bad about eating fat. All these thoughts have made me experiment with the diet. My new thinking is to eat more, much more, vegetables, allowing carbohydrates from these sources while keeping a closer eye on the fat. No bread, pasta, rice, potatoes, sugar, chocolate. You get it. I still eat full-fat versions of cream and cheese. But I prefer my side dish to be broccoli rather than butter so I am not eating as much fat as before. And I am no longer hungry! 200 g of spinach or broccoli is nothing in terms of calories (60 kcal). Not very much in terms of carbohydrates either (but more than most LCHF-people would eat). But it sure is a lot on the plate and it fills your stomach. This is how I need to eat to achieve and maintain my goal weight. It means that I am getting a bit more liberal on the carb count. I am not going to binge eat sugar but I also won't go crazy about 50 g carbohydrates from a healthy meal based on vegetables. We are all different and while some people have to / want to exclude all carbs, other people will be like me and feel sick from the fat and miss the vegetables. This is what a sustainable low carb diet looks like for me, personally. I read about these cereals loaded with sugar and bad breakfast habits. It made me think about breakfast habits across the globe. Breakfast is interesting because it is so different across cultures. Where I come from, lunch and dinner are often inspired by other cuisines, but most people could never think of eating a Thai, Indian, Lebanese, or even Italian inspired breakfast. I think one of the best things of going on a trip is the hotel breakfast - I love breakfast! But I'm not very experimental. My favorites used to be oatmeal, cheese sandwich, yoghurt and muesli or other cereals. Very typical where I come from. No sweet flavors at all, not even sweetened muesli. Let's start with the French "breakfast" - croissant with jam, at the most. And coffee, off course. Simple and light. In Germany, breakfast is the complete opposite. It's a lot! It often equals muesli or a basket of bread and sweet spreads are common but also sausages. The muesli is sweetened with sugar, honey, or even chocolate and having jam on the bread is quite typical. Not to mention Nutella. Rich in calories, very sweet and it will keep you full for a whole day. The Dutch breakfast is sweeter, but smaller. I know a few Dutch people who now get to represent the whole country, but according to them, everyone tops their bread with Nutella or chocolate flakes. I'm not too familiar with southern European breakfast habits. I once lived with a Spanish family while attending a language course. I remember having chocolate milk for breakfast and my lunch bag was packed with sweets. Don't know if it's typical. In Italy, it's quite common to have cake or other sweet pastries for breakfast. Here in the UK, a typical breakfast seems to be toast and jam. Oatmeal can be bought in portion-sized packages labeled "instant", which is ridiculous since that is essentially the exact same product as the big packages for baking. And all of is instant. Well, Quaker made the Americans like their "instant" oatmeal as well. But not as much as they like donuts and muffins for breakfast. I used to live in New York, so this list would be incomplete without the BAGEL. And McDonald's, sadly enough. Heading East, the Russians (women) I know don't eat breakfast at all. They are very petite and health conscious. A cup of tea and a piece of fruit is what they're having. Further East, Indians either don't eat breakfast or they eat any type of warm food. Dinner, lunch, breakfast - it's usually no difference the same for them. Lots of people only eat 2 meals per day, especially in Asia. Or simply any type of food for breakfast, like rice, meat, or vegetables. My Japanese friends eat rice or sushi in the morning, seems to be quite normal. From a low carb perspective, all these breakfasts are notoriously bad. In fact, the traditional UK breakfast minus toast and beans might be the one breakfast best suited for low carb diets. Bacon and egg is and will always be the no. 1 breakfast for all low carbers out there. Is anyone paying attention to the Withings gadget to the right? Withings is our new scale and it's connected to the WiFi. As soon as I step on that scale the results are published here. Pretty scary but out on the street everyone can take a guess on my weight anyway so what's a number on here? As you can see, I had a bit of a negative development lately. I have quite a stressful life and sometimes things happen that will get me out of balance and make me lose focus. It's not a big deal for me as long as I get back on track. This is for life and I am getting more and more health conscious so what's a few days of backlash? Today I gave low carb lasagna a new try for dinner. 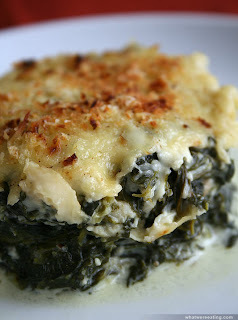 Last time I had to go with cabbage instead of lasagna plates but that's nothing I want to try again. I planned to use sliced zucchini as plates but I couldn't get hold of any today either. Instead I had layers of spinach in between the ground beef. I added broccoli, cauliflower and mushrooms to the beef, too and topped it with home-made cheese sauce to that. It ended up more of a gratin than a typical lasagna but it tasted very good and it was healthy! I've been reading about other low carb diets and came across the Paleo diet. It sounds pretty interesting although for me personally it contains too many starches. From what I understand it is considered to be a low carb diet (might be wrong) but if I would eat according to Paleo I would eat 100 g of carbs per day. Sounds like a lot to me. I also stumbled upon www.30bananasaday.com. I've heard about raw food and fruit diets but I never took it seriously. It's quite an interesting idea, though. You can tell that I am easily fascinated by new things - everything sounds interesting to me :) I don't think I could ever stick to raw food diet, though. Imagine never being able to eat warm food? And imagine eating buying all that fruit! Not to mention the shipping of fruit. Low carb diets are (rightly) criticized for being wasteful as they're based on protein and often includes lots of eggs and dairy products, which use much more resources than crops. But at least you can eat local food when low carbing. Sticking to local food on a fruit diet would be very, very boring here in the north, if at all possible. I love fish and eat it at least a few times per week. And here in the UK there are so many types of fish to chose among and it's fairly cheap, too. I love salmon - great for LCHF too since it's a pretty fat fish. Salmon fillets are great - easy and fast to cook. But it gets a bit boring after a while. A new favorite is smoked salmon! Perfect with a salad, to the omelet, as a snack, with some vegetables... It's so tasty! And it starts with boiled eggs and coffee. A good start! I wonder if it is true that low carb makes your brain slower. I am not sure I noticed any difference. I sometimes have difficulties concentrating when doing boring work, and I think it has changed for the worse in the last weeks. That's something that always bothered me though and now when the weather is getting better I just want to go outside so I don't think it's got anything to do with low carb. Today I have no inspiration what soever for dinner. I'll probably just eat something quick and then go to bed and catch up on some sleep. Today I am really busy. I have a deadline tomorrow and lots of work to do. Yeah, love that! Working on full speed now so hopefully I can finish on time for some exercise tonight. Lean ground beef hamburgers served with lettuce and yellow bell pepper to get some vitamin C. Add to that some melting brie (10 g) and a creme fraiche dressing. That's what was served for dinner tonight. Very tasty. The burgers were home-made. Ready-to-fry burgers from the supermarket usually contain carbs from flour, sugar and other nasty additives I don't want to pay for so that's a no-go. Meal count: 500 kcal and 6 carbs. I only had 1000 kcal so far (but 18 g carbs - strawberries for breakfast - totally worth it). 1000 kcal isn't enough for me - this is not a starvation diet - so will get a snack later. Just came home from running. Great feeling!